Italian firm Tecno was founded by Osvaldo and Fulgenzio Borsani. 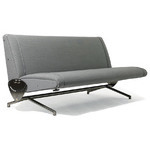 Using Osvaldo's designs, Tecno soon established a reputation for innovative design, particularly in the use of metal frames and polyfoam upholstery. This reputation was boosted by participation in the Milan Triennale of 1954, where visitors could see the flexible D70 divan-bed. 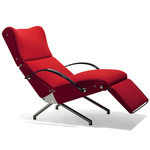 This was followed by the highly versatile P40 lounge chair, which could be adjusted to a variety of seating and reclining positions.